Here's some background information before you dive further into my site. I've always loved animals and always will, once upon a time my goal was to become a veterinarian, however I had to give up those ideas since it's just too hard to get into that school (believe me, I've tried). Anyway my fascination for birds, especially for budgies started 1984 or 1985 when my parents got a pair of budgies, both recessive pied greens (I don't remember the green shade). The summer came and an aunt took care of the budgies and they stayed there and eventually got new owners. A couple of years later we took care of another pair, which happened to be the parents to the first ones. The owners were moving to another city and we were going to take care of their birds until they were settled down (the birds stayed with us the rest of their lives). The male was a recessive pied sky blue and the hen was a recessive pied dark green. After a while we asked the owners if we could give them a nest box and they said OK. The result was four babies, three of them having the colour of the mother and one the colour of the father. I was quick to choose the sky blue baby, which eventually was called Nicke, he was my absolute favourite among all the budgies I've ever had since then, however he's long gone now. You don't have to ask me if I got hooked by these wonderful creatures, since believe me I was. Since I got my first budgie I've had many, many budgerigars and nowadays I'm more into the exhibition type of budgerigars or English budgerigars as they're also called. 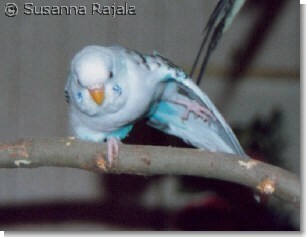 I'm a member of one budgerigar related Swedish Budgerigar hobby (SUH). Anyway I hope that you'll enjoy your visit to my site and hopefully you'll get some additional information about our feathered friends that you didn't know before. Unfortunately I will not have the time to actively maintain this site as often as I'd like to, however every once in a while I'll add something to it somewhere, be it a new photo, new look or a new link. until I got my own scanner in december 1998 (Thanks mom and dad!). This site was created May 19, 1998.